CAMWorks Mill-Turn provides a solution for both milling and turning on the same machine tool. Allowing for increased productivity and flexibility. CAMWorks Mill-Turn for solid Edge multi-function machining includes milling and turning capabilities for multi-tasking machine centers. Machining cycles are available for C, Y and B axis machining at compound angles and on the Face, ID and OD of a part. Generates wrapped toolpath on a cylinder about the turning axis (Z). Z and C arecontrolled simultaneously while the tool stays on the centerline of the part. Toolpath is generated on a fixed C-axis position. For 2.5 Axis Milling, the tool moves to depth in X with Y,Z simultaneous cutting. For 2.5 Axis Milling, the tool moves to depth in one axis with simultaneous cutting in other axes. 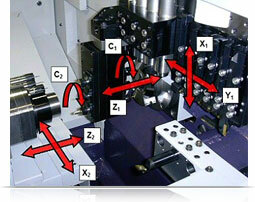 For 2½ Axis Milling, the tool positions to depth in Z with X,Y simultaneous or X,C simultaneous cutting.